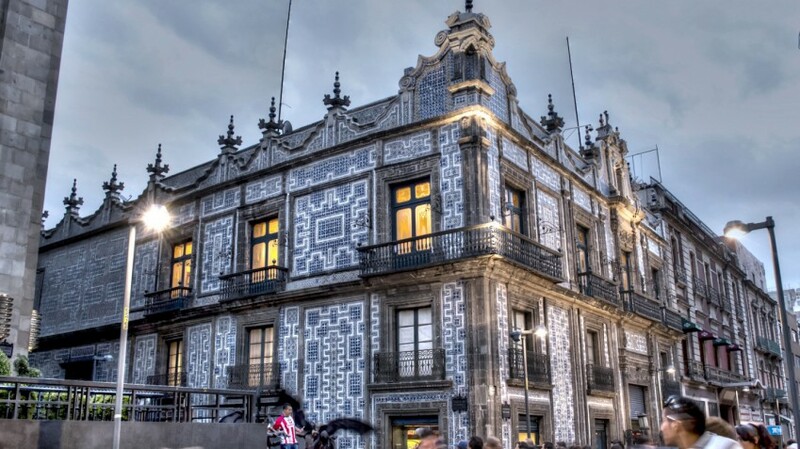 The House of Tiles, better known in Mexico as La Casa de los Azulejos, is one of the many architectural and design gems in the historic section of Mexico City. Less grand than the nearby Palace of Fine Arts and often hidden from view by the crowds that swamp the pedestrian street Francisco Madero, the building has a history as checkered as its tile covered facade. The oldest part of the building was originally constructed as a small palace in the late 1500’s by Don Damian Martinez. One of the many legends about the building retells the story of Don Damian becoming in deep financial debt to Don Diego de Peredo. In lieu of raising the $6,500 pesos owed, in 1596, Don Damien turned over the little palace to Don Diego, who also acquired the adjacent plaza that was used to enlarge the building several generations later. The legend continues that Don Diego, who first cherished the building and named it the Blue Palace, ultimately was jaded by material wealth and retired to a Franciscan monastic order in Zacatecas, deeding the building and nearby property to his daughter, Graciana. Graciana was married to the Count of the Valley of Orizaba, the beautiful fertile area in the present State of Veracruz. Over the next few generations the building was inherited by their descendant, also a Count. According to some reports, given the vast holdings and other residences of the Orizabas and the distance from the ancestral lands, the little palace fell into disuse and decayed until one of the subsequent counts realized the potential of the area and restored, enlarged, and redecorated the building. But wait! the official story promoted by more recent owners is more charming. One of the Orizaba sons, the heir apparent to the title and building, was more interested in fiestas and other wasteful pursuits than in the family business. His despairing father told him that he was a good-for-nothing who would not go far in life and would never be able to build a Casa de los Azulejos. The son, reportedly, immediately changed his life and promised to become hard-working and to restore the Blue Palace and cover the outside with beautiful tiles. He did, and the building was renamed the House of Tiles. Independent of which version is true, the House of Tiles stayed in the Orizaba family until 1871 when the family line ended. During the Orizaba epochs the House of Tiles became the site of many noteworthy events, both fanciful and historic. One amusing story is set immediately outside the Casa in the narrow alley that runs along one side. Two nobles coming from opposite directions in their coaches met head on, and each thought he was too important to back up his coach. They were at an impasse for three days. Finally the viceroy sent staff who negotiated and orchestrated a simultaneous withdrawal with each noble’s coach backing up the way they entered the alley. The house itself was also the site of a murder and a “miracle.” The murder took place on December 4, 1828, when a government official, Manuel Palacios, stabbed Count Diego Suarez de Paredo to death as he was coming down the central magnificent staircase of the Casa. Although the city was then in turmoil, and violence was rampant because the results of the recent presidential elections were being challenged, the motive for the murder was deemed to be romantic – a personal dispute over Palacios’ wooing one of the household. The “miracle” took place about a century earlier, when a recently installed colorful statue of Christ on loan from the Convent of San Francisco was attributed with saving the House from devastation during the severe earthquake of November 7, 1731. After the earthquake, the statute was observed to be bleeding from the wound portrayed on the side of the figure, and all the color in the face had turned pale. Following the end of the Orizaba occupancy, the history became more prosaic. Ownership was transferred several times in the next couple of decades and in 1891 the Iturbe family who owned the building turned it over to the prestigious and exclusive Mexico City Jockey Club. The membership-only Jockey Club still exists today, albeit at a different venue and was recently described in the magazine Chilango as “the only place in Mexico that will make you feel at Ascot, but without the need to wear silly hats, but the rules of etiquette are somewhat snobbish.” The residential areas of the palace were remodeled and decorated for the comfort of the upper-class Club members’ dining, dancing, meeting and greeting. The presence of the Jockey Club was relatively brief and once again the building fell into disuse until in 1919 two enterprising young Americans, Walter and Frank Sanborn, immigrants from California, recognized the potential of the House of Tiles as a palace restaurant for the hoi-polloi. The Sanborn brothers began their business in Mexico in 1903 by opening pharmacies and soda fountains in Mexico City and one in Tampico that was reportedly burned down during anti-American riots. Once they realized the possibilities of the House of Tiles, not only for a soda fountain and pharmacy, but also for a restaurant, tearoom and gift shop, they sold the remaining small businesses to raise the collateral to take over and restore the Casa de los Azulejos. A year of intense restoration took place, including the commission and completion of a magnificent mural by the world-famous Mexican artist Orozco, which overlooks the nefarious staircase where the murder had occurred. The grand reopening of the House of Tiles in 1920 was deemed a great success, not only by ordinary people who were the primary client-target for the Sanborns but also by the notables of Mexico City. Outside were the glistening blue and white tiles filling the facades in four directions; these original tiles were made either in China or more likely in a talavera workshop in Puebla, no one seems to be quite sure. The black filigree railing of the many external balconies gleamed. And the churrigueresque (Spanish Baroque) style stone work which topped the building reminded people of the long history of the palace. The inside was and remains magnificent until today, with one exception. Oddly, if one enters the House through the little door right on the pedestrian street, the scene is a commonplace long and convoluted lunch counter with a few booths. But through the main entrance around the corner, the entrance through which the grand opening attendees were welcomed, the opulence is immediately experienced through the wide door leading into the central courtyard. To be truly appreciated, an hour or more is needed to study the three-story high, glass roofed courtyard. Fortunately, Sanborns is more than happy to provide a table, a reasonably-priced meal and music (piano or violin) while one does so. And even the most health cautious visitor will be assured about the wholesomeness of the food by the view of the sparkling-clean white kitchen and the staff in their white and blue uniforms and head-coverings. The courtyard floor itself is worth a few minutes of appreciation; the large floor tiles are virtually every shade of brown and tan but provide a harmonious foundation. The walls merit much more time for scrutiny. The overall impression they create is one of being in a palatial outdoor garden. One wall is home to a stone niche that holds a burbling stone fountain. The niche is outlined with blue and white Chinese or talavera tiles. Flanking the niche are two murals of gardens with peacocks that echo the large garden mural that fills the opposite wall. The large mural is centered on a painted fountain diametrically opposite to the operating stone fountain and is filled with whimsical representations of exotic birds and flowers, including one bird that appears to have recently expired, and other fountains. Below the murals are borders of faux-tiles in greens and oranges that appear to be stucco until one examines them more closely. And under the faux tiles are rich dark wood wainscots. Several peacocks seem to have escaped the murals and are perched on doorways and other ledges in the courtyard. One peacock that is part of the large mural dramatically drapes its tail down over the faux-tiles to reach the wainscot. The other two walls are lined with faux tiles and actual stone columns that are in the same Spanish baroque style as the exterior stone work. Original bronze railings, which have definitely been identified as Chinese, draw one’s eyes up to the second level balcony that circles the perimeter of the courtyard. The walls of the second floor balcony are decorated with huge mirrors framed in ornate gold with theatrical porcelain faces. Etched glass doors can be seen from below leading into rooms whose purpose seem to be private unless one climbs the nefarious staircase to explore. Given the glass roof that covers the courtyard, the third floor balconies are perfect for a solarium environment and are lined with planters containing palms, ficus, and other greenery. While the courtyard is a must for a meal for first-time visitors and for locals who prefer the garden setting, second floor opportunities include some charming alternatives. The Salon Jockey provides the muted opulence of the prerevolutionary era. The walls are painted in soft pastels including blues, violets, and creams. Lovely delicate moldings add to the décor. And a magnificent crystal chandelier adds to the feeling of a different age. A more rustic setting is provided in the Salon Colonial with an impressive wood-beamed ceiling. And the bar room with its rich dark wood walls and small crystal chandeliers appears to be conducive to quiet conversations, since a pianist plays soft background music. Today, Sanborns has morphed into a multinational corporation headed by a son of a Lebanese immigrant – the billionaire philanthropist Carlos Slim Helu. The House of Tiles still is the flagship of the hundreds of Sanborn restaurants. The building stands as a testament to the essence of Mexico – a palace for ordinary people.